May 07, 2011 by Alphageek in "alphageek", "cooking"
Today's post is going to start out simply enough. Mrs. Alphageek and I were listening to a podcast called the Merry Sporkful. During the beginning of the podcast, the announcers take a minute or two to talk about something that they ate and enjoyed since their previous podcast. One of the announcers mentioned something he ate while on vacation. 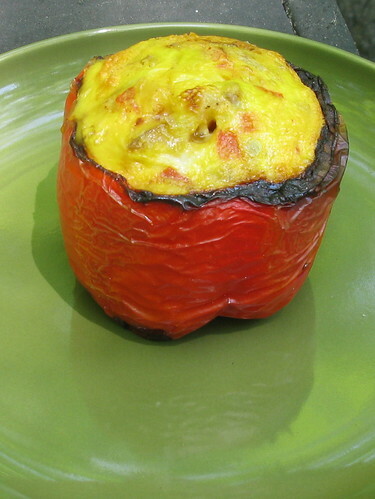 I don't remember the Spanish name for the dish, but it basically was egg in a pepper that was cooked on the grill. Of course, my eyes lit right up at this description. I thought it sounded great and decided to mark it down as a dish I would make on the grill in the next few weeks. I am the kind of geek that thinks he can cook just about anything, so I feel up to the challenge. That day has arrived. Pictured below are the ingredients that I decided to use. 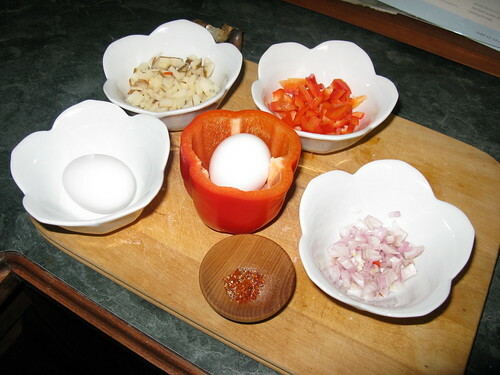 We have a couple of eggs, a red bell pepper, some potatoes, the top of the red pepper, a little shallot, some garlic, salt, pepper, and a touch of my Pinger Pepper from a previous episode. You are allowed to borrow from yourself. 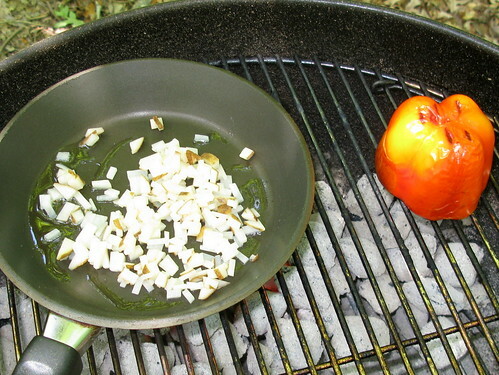 I diced up everything very finely, because I wanted the ingredients to cook throughly while on the grill. 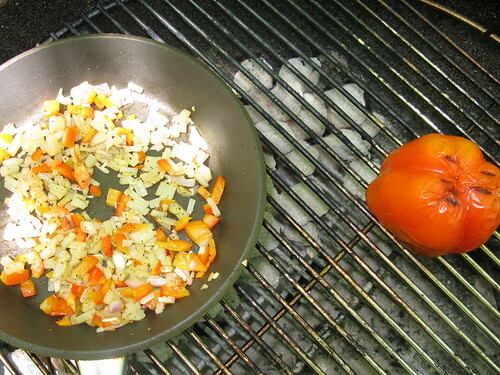 Next, I walked outside and place the pepper on indirect heat on the grill. 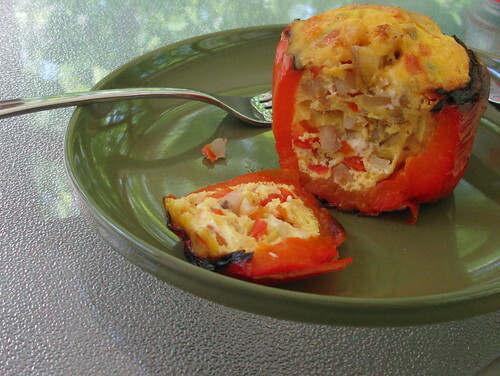 If you decide to try this, you should put the pepper on hole side down. 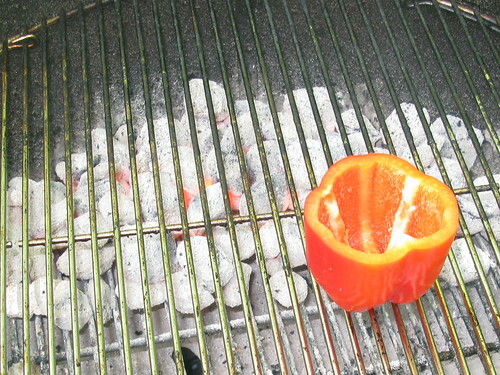 Hole side down will prevent water from collecting inside the pepper and slowing the cooking process down. Next, I placed the skillet on the grill, put some oil in the skillet, and added the potatoes after the oil was hot. I simmered this for about five minutes. It was smelling great already. Next, I added the rest of the ingredients. The combination of aromas was beginning to make me very hungry. Next came one of the few tricky parts. I had to remember to turn the pepper back over (hey its tough for some folks) and pour the ingredients from the skillet into the eggs. 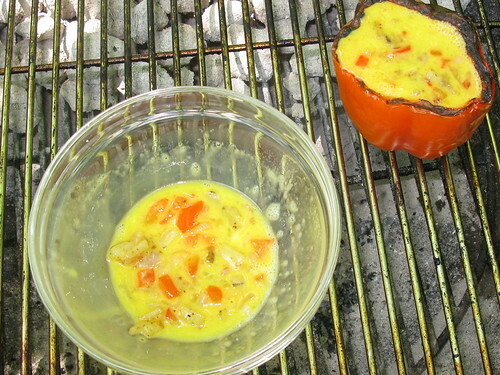 If you go the other direction, you will cook the eggs in the pan and not in the pepper. Finally, I poured the mixture into the pepper. Sure, I had a little left over, but I just put that in the skillet and cooked it up right there. At this point comes the hardest part of the preparation. I had to put the lid on the grill, and walk away. I let everything cook to about 160 degrees Fahrenheit. You do have a food thermometer, right? I then pulled the final dish off of the grill as shown below. Below is an inside view that I liked so much, I went and grabbed the camera when I was ready to eat. So, how would I review my own food? In a word, it is great! The smoke flavor goes well with the the pepper, and the other ingredients turn what could be a very simple dish into something special. The food thermometer made all of the difference. If the dish had cooked anymore, it would have begun to dry out and who wants that? This is a simple, easy dish that can impress your fiends at breakfast, or any other meal, as well as an early morning tailgate. It is good to know my culinary skill served me well again today.